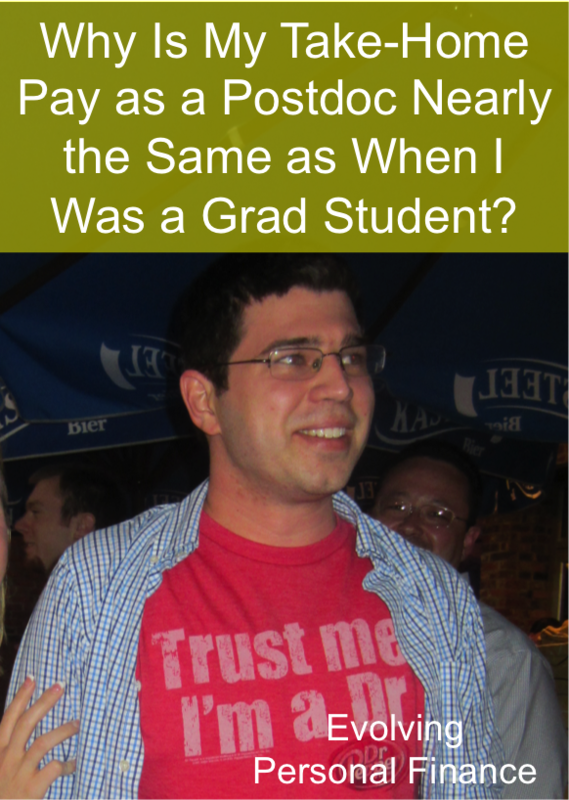 Why Is My Take-Home Pay as a Postdoc Nearly the Same as When I Was a Grad Student? Despite the fact that Kyle got over a 40% raise when he transitioned from grad student to postdoc, his postdoc take-home pay is depressingly similar to his grad student take-home pay. I had heard rumors of this phenomenon but had never quite believed it. The reasons for it are partially generalizable and partially specific to us, but I hope they are illuminating for other people going through this same transition. Kyle gave me permission to share his gross and net income breakdowns for this one post only so don’t expect to see them again. 😉 His postdoc gross monthly income is $3,500 and his gross grad student monthly stipend just before he defended was $2,451.65. Looks like a big difference, right? Well, let’s move the pay from gross to take-home. First, Kyle pays federal and state income tax on both of those incomes. Kyle didn’t change his withholdings at all in the transition so they should be comparable. Based on Kyle’s income alone, we should pay a slightly higher effective income tax rate with his new position. Even though we’re in the same marginal tax bracket as we were previously, more of his income is taxed at the top marginal rate. The federal and state income tax withheld from his postdoc salary is $478.89 and from his grad student stipend was $309.06. Second, Kyle has FICA taxes withheld from his postdoc salary. Grad students at universities are exempted from FICA taxes (generally speaking: source). This amounts to $250.19. Third, Kyle has to have health insurance. As a grad student, his health insurance was paid by a separate scholarship and didn’t affect his take-home pay. As a postdoc, he pays health insurance premiums through a payroll deduction. This is where YMMV. We chose the most basic health insurance plan offered by our university, which is actually not as much insurance as was given to us as grad students. Kyle’s monthly premium, which is quite subsidized, is $29. However, I am also on this insurance plan (a change from when we were grad students when we were each on our own plans) and my not-very-subsidized premium is $191. We also added a vision insurance rider for Kyle only for $9.47 per month. Those are the big rocks. One small rock is that Kyle plans to join the university gym. As a grad student, this fee was paid on his behalf. As a postdoc, he will pay the monthly membership fee as a payroll deduction. The ongoing monthly fee is $16.67. So when we directly compare the two take-home pays, we see that the only change in benefits is really the health insurance – we have less insurance and we’re covering both of us instead of just Kyle, plus Kyle has vision insurance whereas before we just had a yearly voucher. It just illustrates that there are so many monetary benefits of being a grad student! For almost no change in benefits and the same marginal income tax bracket, we are looking at only a $382.19 or 18% increase in Kyle’s take-home pay for finishing his PhD! That’s less than half of the raise we thought he would get percentage-wise based on his gross pay increase. Other grad students might have a slightly different configuration of deductions, but the theme of postdocs being surprised by how low their take-home pay is right after finishing grad school is one I’ve heard over and over. If the person had recently moved to a higher cost-of-living area, it’s very possible that their effective take-home pay could even decrease, depending on how much cost-of-living consideration the university gives. That it is so common to barely get a net raise for finishing your PhD and becoming a postdoc just reinforces that postdocs are still in training and the real job is still at least one transition away! 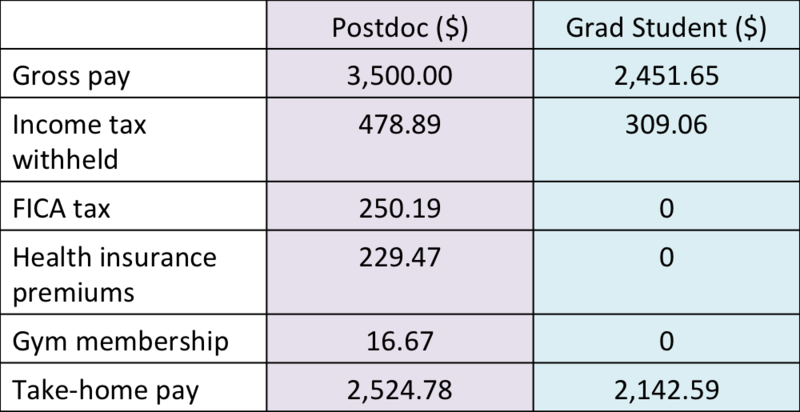 Did you experience the disappointment of your postdoc take-home pay being barely higher than your grad student take-home pay? Have you ever found that a raise in gross pay did not translate to take-home once taxes and cost-of-living were taken into account? 19 Responses to "Why Is My Take-Home Pay as a Postdoc Nearly the Same as When I Was a Grad Student?" Thanks for your comment! We also were unprepared for how much health insurance would affect Kyle’s take-home pay. I’m sort of wishing I had gone for the catastrophic plan through our state! I was still pretty shocked by FICA even though I knew it was coming. One thing I didn’t add in this post but just realized… state income taxes could be a shock as well if the job change involves a move from a low-tax state to a high-tax one. I was never paid as a grad student, so I can’t speak directly to the paycheck changes you see. But I always tell people entering the work force to expect their take home pay to be only about 60% – 70% of their gross pay. With a good salaried job, after you take out Fed/State/Local income tax, FICA, and health/dental/life insurance, it seems to almost always come out in the 60% to 70% range. Kyle is around 72%, so he’s in that ballpark. A more comprehensive health insurance plan would probably put him in that range. We still have it pretty “good” in the sense that we have a low income so our taxes are pretty low. But I’ll be excited to get more toward that 60% figure because it means we’ll be making more money! In the future I hope our take-home pay is an even smaller percentage because of great payroll deductions like a 401(k), better insurance, and an HSA. Yep! My first job out as a Lab Instructor was pitiful, and was less than a PDF, even though they “required” a PhD. My take home was $300 more per month for those few months, but it’s more confusing here because our stipends are not taxed. Not being used to having a taxed income really threw me for a loop. That is partly the reason why I didn’t do a PDF. It’s such a raw deal. It’s part of the Academic training, AFTER 5+ years of school, and then they expect another 2+ years at around 40k (50-60k if you get an industrial position). Plus, I knew I didn’t want to be a prof, so it didn’t serve much purpose to me. But money was absolutely a factor in the decision. Coming out of grad school at 27 (for me) I didn’t want to be 30 before I made 60k+, and then have loads to catch up on. So I cut out the PDF (the one I was offered would have been 40k). I think it all depends on your career track. I’m happy skipping the postdoc and going straight to a real job (hopefully? eventually?) but Kyle thinks a postdoc is necessary for an industry job in his field, even though it is a bad deal. Ugh, academia. Going from having non-taxed income to taxed must be pretty crazy, too, but you all probably have high awareness of the exception made during grad school. I think for us the FICA exemption isn’t something that most students realize is happening (I didn’t!) unless they were working before they started grad school. Wow, even a huge pay raise doesn’t feel as huge anymore. We saw a big drop in my husband’s pay as well when I joined his plan. It’s free to him and about $160 for me. and my take home pay was more or less the same. also in your case-you went from having your own health plan to being on someone else’s plan-that does cost money. 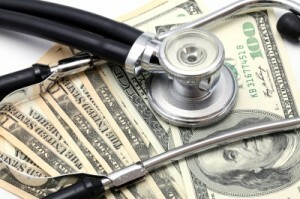 the years past when even family health plans were totally subsidized by the job are long gone! This is Kyle’s first time contributing to SS since some summer jobs many many years ago, so I guess it will be 35 years from here going forward! I think I wouldn’t mind too much if my take-home pay were the same but I had started funding retirement to the max like you did, but we are just plugging away with a 15% contribution (down from 18% before I stopped working). And really, this does all weigh on us more because I’m not bringing in much money right now. 🙂 When you made your fellowship to instructor transition did you stay at the same university or in the same city? The less change there was, the easier it would be to swallow the steady take-home pay, I would imagine. I hope you saw that I highlighted a recent comment of yours in my round-up post from last Saturday! Thanks for sharing your experiences here! I’d love to hear more about finances (or anything!) of a post-doc. It sounds like they are becoming more and more expected, almost an extension of the Ph.D. So my postdoc is a much better deal for me even though I am now paying FICA and monthly insurance premiums. My salary is up about $20,000 from where it was my last graduate school year. Over the course of the year I’ll have $12000 of that withheld, pre-tax, for retirement, plus about $1200 pre-tax for various insurance premiums. The rest is taxed at the normal federal/state rate plus FICA. The end result is a take-home pay that’s not all that far off what I got my last year in grad school, except that I’m finally contributing to SS again (so I might actually get some one of these days), I’m sending a decent amount to retirement, and my medical care situation is WAY improved and except for co-pays doesn’t have to come out of my take-home pay. I’m glad to hear that you’re getting many more benefits, even with a similar take-home pay. That retirement contribution is a great reason to have a lower take-home pay! Getting a 20k$ raise and lowering state tax helped for sure to offset some of those payroll deductions. Great job all around! But it feels good to contribute taxes to help society yeah? Financial Samurai recently posted..Should I Contribute To My 401K Or Invest In An After-Tax Brokerage Account? Hm, good question. I guess I’m okay with social security for (lifelong) disabled people, so maybe?